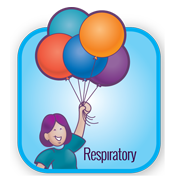 The goal of this online tutorial is to help nurses accurately assess the respiratory system, identify normal findings, and recognize abnormal findings. Increased knowledge of the anatomy, physiology, and assessment of the respiratory system will help nurses keep their patients' major body systems functioning at their highest level. The content is divided into six modules The first five are instructional units. The final module is a test bank. The tests in the test bank cover all of the tutorial modules. Students are given their test results at the completion of each test accompanied by correct answers and rationale. Instructor can use these tests as pre- or post-tests. Test scores can be used to monitor student progress and mastery of the subject matter. Test results are recorded in databases on the EDGT server and are available for retrieval and review by both instructors and students. Discuss the anatomy of the respiratory system. Describe the physiology of the respiratory system. Identify normal respiratory assessment findings. Recognize abnormal respiratory assessment findings. Identify possible causes for abnormal findings. Identify common nursing interventions for patients with compromised respiratory systems. Integrate knowledge of respiratory anatomy and physiology into the development of a plan of care that will achieve the desired patient outcomes. Evaluate it before you buy! Preview this complete online tutorial and its tests for free! Just order the 30-Day Free Evaluation in the Products area of our website. With this free evaluation, you can see if this online tutorial meets the learning needs of your students. The purchase price includes an unlimited number of users at the site of purchase for a period of one year. Additional campuses may purchase access to the tutorial for half price. Browse our tutorial products right here on EDGT.com and purchase products using our secure shopping cart. We accept major credit cards, purchase orders, and checks.